Most pickup trucks sold today have internal combustion engines. Passenger vehicles are powered by two main types of engines: compression, aka diesel, and spark ignition, aka gasoline. Besides the type of fuel they burn, what are the differences between a gasoline engine and a diesel engine? Intake: The piston moves from top dead center to bottom dead center with the intake valve(s) open. If fuel is injected into the throttle body or intake manifold, then it is pulled into the cylinder with the air. If fuel is directly injected, then it may be injected near the end of the intake stroke and into the beginning of the compression stroke. Compression: All valves close and the piston moves from bottom to top dead center. Near the end of the compression stroke the spark plug fires, igniting the air-fuel mixture. Power: The piston moves from top to bottom dead center with all valves closed. The air inside the cylinder expands from the combustion of the air-fuel mixture. This provides the driving force for the engine. Exhaust: The piston moves from bottom to top dead center with the exhaust valve(s) open, pushing the exhaust out. In spark ignition engines, the fuel can be injected into the intake manifold, just before the air intake valve, or directly into the cylinders, but it is always injected before the spark plug fires. Combustion occurs from the spark plug igniting the air-fuel mixture when the piston is very close to top dead center in the cylinder. The piston head and the cylinder head are typically shaped specifically for air flow into and out of the cylinder, and for the most even combustion burn throughout the cylinder as possible. Spark ignition engines use a throttle to limit the amount of air entering the engine. Limiting the air will also limit the amount of fuel that is injected into the combustion chamber and therefore reduce the power output. Modern engines have sensors in the exhaust and intake to see how much air is flowing into the engine, and how much fuel is needed for a complete burn in the combustion chamber. The engine computer also controls when the spark plug fires. As you might suspect, these variables change with altitude (different ambient air pressure), engine load, engine rpm and weather conditions. Gasoline engines usually have a compression ratio around 10 to 1, which is about half of what most diesel engines run. The lower compression ratio helps stop preignition, which is when the air-fuel mixture ignites from being compressed instead of from the spark plug. Preignition can lower efficiency and power output, and when things really go bad it can heavily damage an engine. That’s why using the proper octane rating for your vehicle is so important for proper engine health and longevity. Spark ignition engines generally reach their peak power output at higher RPMs when compared to compression ignition engines. 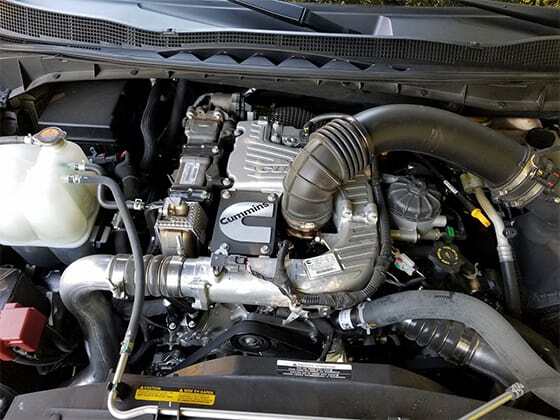 With horsepower being a function of torque and engine speed, gas engines are typically better able to achieve higher horsepower than diesel engines. They also rev faster due to a faster energy release and lighter (less heavy duty) rotating mass. The faster energy release comes from the spark ignition and using gasoline instead of diesel fuel. When compared to diesel fuel, gasoline is more refined as well, and is easier to ignite — it also burns cleaner and quicker. This is one reason why most high-performance vehicles use spark ignition engines. 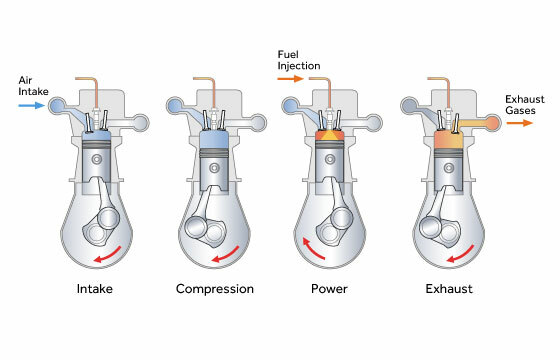 Compression ignition engines also most commonly run on the four-stroke cycle; however, compression ignition engines differ from spark-ignition engines in many ways. For example, compression engines don’t have a traditional throttle, the compression ratio is significantly higher, they use a different fuel, the fuel is injected at a different time and place, and the fuel is ignited using a completely different method. For compression ignition engines, there is no throttle to restrict air flow while the engine is running. This means that no matter what the load might be on the engine, the same amount of air will enter the cylinders. 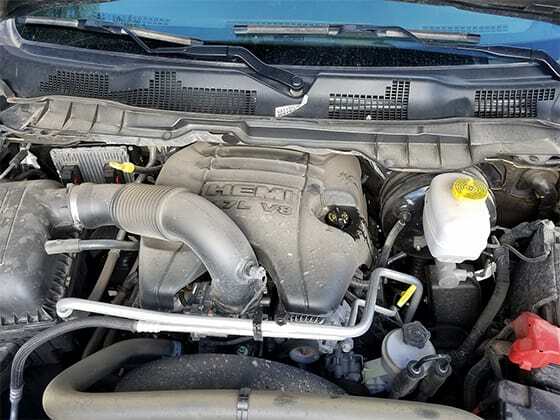 This also causes the engine to spend a significant amount of its life running in a fuel lean state, making the engine run hotter, but compression engines are built to compensate for this. Compression ignition engines ignite the air-fuel mixture by heat and compression rather than the spark plug igniter of a gasoline engine. For this to work effectively, the engine needs to have a high compression ratio; many diesel engines have a compression ratio in the 20-to-1 range. As you might imagine, this puts a lot more stress on the engine components, but also allows the engine to have a higher torque output. 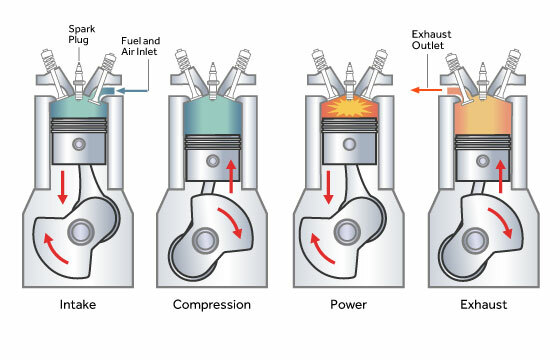 Because compression ignition engines need heat for the ignition to happen, they are susceptible to hard starts in cold environments; however, technology in diesel engines has come a long way, and most modern diesel engines can be started even in extremely cold temperatures, without the use of an engine block heater. Fuel is injected directly into the cylinders. To avoid preignition, fuel injection starts at the end of the compression stroke when the piston is very near the top dead center and continues with most of the fuel being injected during the power stroke. The injectors must also inject the fuel at very high pressures to overcome the higher compression ratio. Spark ignition engine fuel injectors run in the 20-to-50 pounds-per-square-inch range, while modern compression ignition engine fuel injectors run in the 30,000-to-50,000 psi range. The high-pressure injection also helps to better atomize the fuel, making for a cleaner and a more complete burn. Ignition begins as soon as fuel is injected into the cylinder and continues until fuel stops being injected. In theory, spark ignition can be thought of as an instantaneous ignition where all the fuel is burned in a very short amount of time. With compression ignition the opposite is true, the fuel is burned more slowly over a longer period. Diesel engines tend to have high torque output at a low rpm. This torque comes from the longer fuel burn time, diesel fuel having more energy by volume and the high compression ratio. To handle the extra force on the engine, many of the components of a diesel engine are larger or use higher-strength materials. This makes diesel engines ideal for heavy workloads, especially when they are run at a constant RPM. Power generators, ships, trains (modern trains use diesel generators to power electric motors) and heavy equipment all use diesel engines because of the high torque output at lower engine speed. Another benefit of a diesel engine is that the higher compression ratio aids in engine braking. For pickups, diesel engines are great for towing heavy loads over long distances and typically provide longer life cycles. 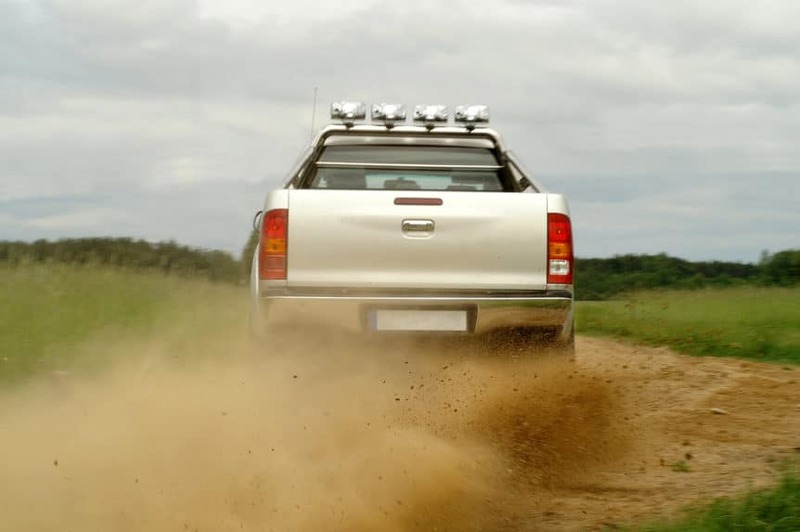 There are advantages and disadvantages to spark and compression ignition engines for pickups. Diesel engines are built with stronger components and move at slower speeds, which helps with their longevity. Diesel engines also weigh significantly more than similarly sized gas engines. Gas engines will cost less up front, but diesel engines hold their value over longer timeframes. 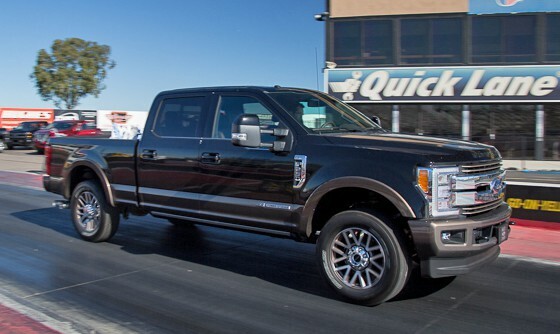 However, with newer emissions restrictions, diesel no longer provides a significant fuel economy advantage over gas engines, especially when running lighter loads in full-size pickups.